According to the Washington Post, North Korea is sanctioned out. The country is already so heavily sanctioned that more restrictions won’t have any effect; there is nothing left to take away. 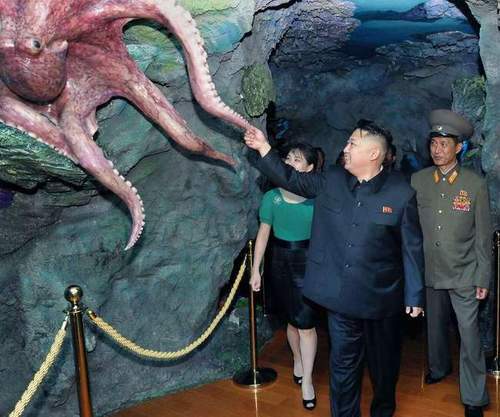 Kim Jong-un doesn’t even have a real octopus to look at any more (touching a life-size replica is much safer anyway). So what will be the response to North Korea’s latest act of defiance? Luckily for Kim Jung Il, their latest nuclear test is not something that President Obama can simply sweep under the rug-as much as he might like to do so. Thanks to the Comprehensive Test Ban Treaty Organization, there is an international organization that monitors and reports on evidence of nuclear weapons tests. That frees up Kim Jung Un to lay his gaze on more important things because others are doing the work of publicizing the size ( 7kt) of his nation’s nuclear test. In fact, not to be out done by Iran, North Korea tested just in time to warrant a mention in Obama’s State of the Union address. He singled out North Korea as a threat, but didn’t further elaborate on earlier statements condemning the test and calling for “swift and credible action” from the international community. North Korea has perfected the art of bringing powerful members of the international community to the bargaining table, holding out the carrot of giving up its nuclear program in order to compel the provision of goods and services in return for the promise of a nuclear-free Korean Peninsula. It’s a good gambit as long as North Korea can keep it up.